What I have in mind is a speedometer-like battery indicator. 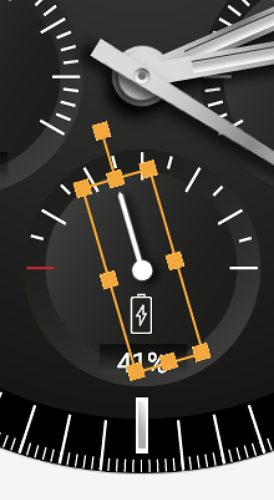 A needle that shows current battery percentage, see this watchface with the smaller circle 0-100, which should represent the percentage stats. Sounds great! There's lots of tutorials out there for it.. I think searching "gauge" or "fuel" can help. TOMAJA has some great tutorials! 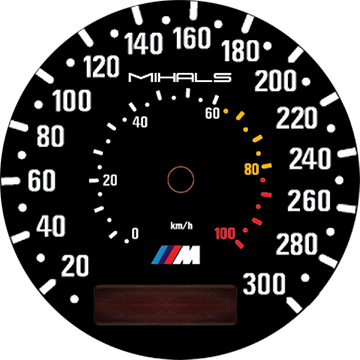 You need to know the starting angle, and the ending angle - typically for a speedometer style gauge (like the one you show), it will be either -120 or +240 degrees. Then measure how far you want the needle to rotate (Say 240 degrees - so that it will rotate from -120 degrees to +120 degrees from vertical). Wow, that really helps a lot! Thanks for being so patient with me, complete novice!!! Now I know NEARLY everything I need. Last thing I don't understand is WHERE I enter all these codes? It's not in the Facer editor, is it? Also, if I click the "option icon" next to your watch, I don't get the "inspection mode", only "Report"
As far as inspection mode goes, you have to click on the name of the watch, if you see a little rocketship on the left, inspect mode is available. Alternately, you can just add /inspect to the url of a watch. Firstly let me say thank you. This is a very easy to understand tutorial. I have a question about the battery dial version. I have done everything that you have suggested but have noticed an anomaly. When testing the indicator with time lapse, at 4 mins to midnight, the dial hand returns to the upright 12 position rather than remaining at empty and then going straight to full. To explain it using your pictures, the hand is placed in the dial at the 12 o'clock position. The +-150 work perfectly, but at the 4 minutes to midnight the dial goes from empty to 12 o'clock position and sits there until midnight and then moves to the full position. Have I done something wrong? In this comparison, maybe you agree too, that this one is very simple. If you select the battery dial hand and look at the "rotation" settings you should see how to use. 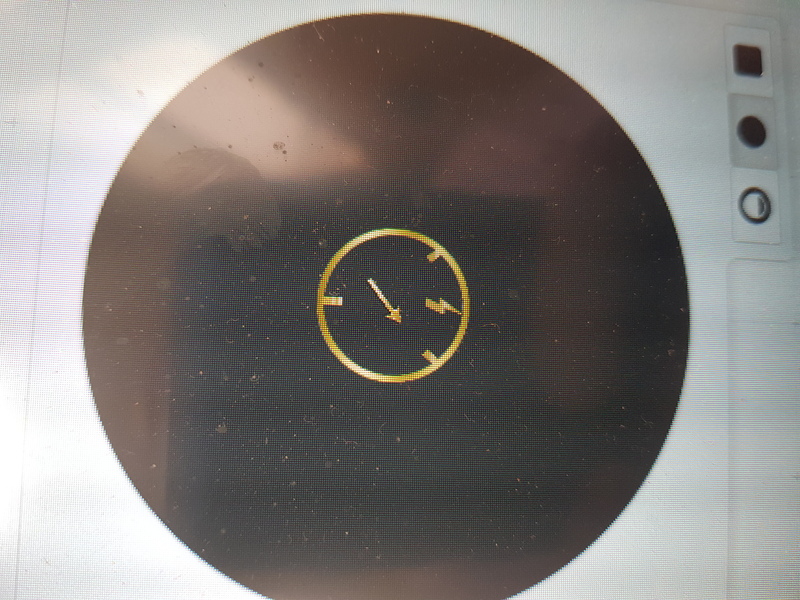 When you initially import your dial-hand image it should be set to the 12:00 position. The red tick marker (0% battery) is -90 degrees from the 12:00 position and so this becomes its starting poistion. The hand has to rotate 180 degrees from the red marker (0%) to the opposite white marker (100% battery) so we multiply the Battery Level Number (BLN) by 1.8 (180degrees/100 percent). It can seem very confusing at first I agree, but persevere. Firstly you should understand that Facer sees the top point of a dial/circle as 0 degrees. Next, you need to work out the angle position of your markers for 0% battery level and 100% battery level. Next, the battery is represented as a percentage, which means it has 100 x 1% increments. To work out how far the hand has to rotate for each 1%, we divide the total rotation amount (180) by 100 which gives us 1.8 degrees (180/100=1.8). 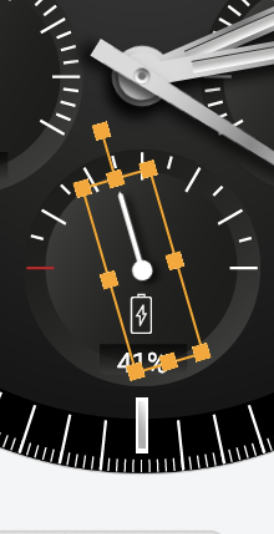 So we now know the hand has to rotate 1.8 degrees for each 1% increment of the battery level. Well, i think this doesn‘t help him a lot. He want‘s a quick and dirty solution - with predefined hands, bezels, formulae ... an easy assembling system without any effort. It can be a steep learning curve for people who may never have used any code before, but I believe with a little perseverance most people can do it. I agree, but we are nowadays seem to live in a world where people don‘t have endurance. They don‘t want effort, don‘t want to learn. If he asked friendly i maybe would have spend him some of my dials, dials that took me time and effort to create. I can't imagine Facer want to turn people away from creating faces just because they can't make the more complex elements themselves so maybe some of the experienced people on here should start a service for those who can't/won't code. There could be a repository of stock modules like dials, gauges, basic animations etc. A nice way to give back to the community.